It seems like the older you get, there’s a change in your feelings about having plans. When you’re young, plans are everything. What should we do? Where are we going? Who’s going to be there? These are very important social questions. However, as time ticks along, having plans becomes less and less important. Have you ever asked an adult what they’re doing this weekend, and their face lights up as they exclaim with delight, “absolutely nothing!”? Not having plans can be a great plan. And sometimes, these nights turn out to be even better than any night filled with plans ever could. 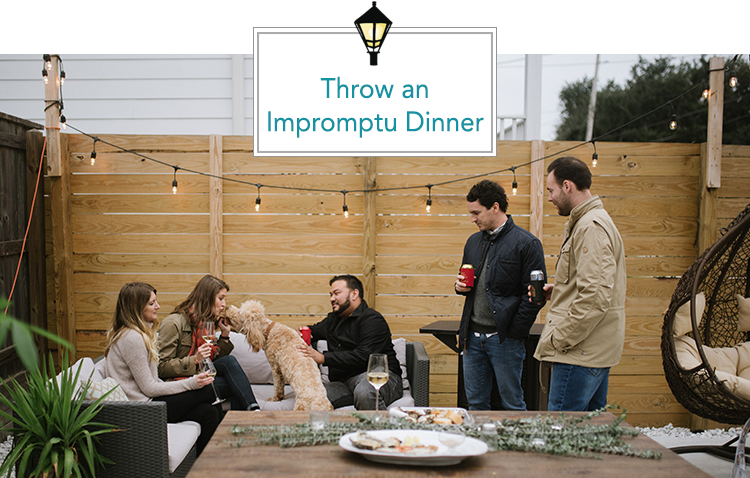 So, now that you’ve ditched your plans and decided to stay in tonight (contain your excitement), how about throwing an impromptu dinner? Let’s look at how to do this, and do it well! Outside of family and friends (and ok, probably football) life down here in the New Orleans, Northshore, Baton Rouge and Mississippi Gulf Coast areas is all about food and drink. So, if you want your night to be a success you need to have the essentials in your toolkit. For starters, no pun intended, this means good cheese and delicious wine. You could stop there, and it’s a great night! By having these essentials on hand (plus a few other things like assorted beer and snacks and maybe another alcohol option), you’ll always be ready, and you won’t have to stress! So, you’ve got the apps and alcohol ready. Now, you just need people to enjoy it with. Get out your phone and send out a few texts saying “hey, let’s stay in tonight and eat and drink together!” We guarantee there are a few of your friends who are doing the exact same thing, enjoying a night of no plans. If you catch a few with a wild hair, you’ve suddenly got RSVPs for a phenomenal impromptu night. Now you’ve got snacks, drinks and friends, so all that’s left is the main course. Can you throw something together that you’ve already got at the house? Should you simply order a pizza and breadsticks? Order amazing Chinese food from Uber Eats? This is where not planning can be fun because the options are endless. For you planners and perfectionists, this last tip may be the hardest to check off. The point of this is to learn to not stress and just have fun winging it. But we know that no plans equate to stress for some people, so this step is important. If you don’t have a certain ingredient or that perfect bottle of wine or your wifi is a little slow while streaming music, that’s ok. Your impromptu dinner is a chance to be with family and friends and relax, so focus on the fun, and don’t sweat the small stuff!